A new style of wargaming. Musket Smoke players speak out. I was just looking through some of the reviews from various countries. Trying to generate some energy for my next batch of programming when I realized that my ultimate goal with this game has been publicly stated. I also wanted a game with enormous tactical options, that was quick and easy to pick up and fun to play. There are not a LOT of you sharing what you think of the game, but for those of you who did – thank you very much. It makes it all that much more worth it. Here is what some of you are saying from around the world. (Austria) “I wouldn’t mind more FOW and not sure about the lack of randomness – beside mortar fire. The online Mini Match multiplayer group was divided recently. Players were separated into 2 groups and so there should be a bit of a lull for a few days while the new players ‘graduate’ from the safe zone. This will hit us with a minor slowdown in the ‘random opponent’ stream but the eventual end result will be more new players sticking around as they gain some confidence and get their ‘combat legs’ so to speak. If you are in the safety zone waiting for a matchup and find things a bit slow try entering the ‘random opponent’ group. It will be more brutal but suffering a couple battles in that harder group will teach you well and likely have you dominating all your safety zone matches. So to do that you tap the ‘safety zone’ tab and it will cycle to the ‘random opponent’ tab. After you do that, then hit the ‘create Mini Match’. New Users! Try a Mini Match. Only 9% of new users are trying the core feature – on-line play. That is not a great statistic, because Musket Smoke is 95% focused on online play. You are missing out on a grand experience if you ignore the core feature of Musket Smoke. You are NOT going to be destroyed by experienced players because we now have a ‘Safe New User Zone’. This new safety zone is a beta feature and you might have to wait a while for a matchup so start-up a match before you do anything. Dive right in. Likely you will have to wait for your opponent so that will give you time while you read the manual or do the tutorial or play some solo rounds vs the AI in the solo training area. If you are lucky and don’t have to wait then enjoy playing someone from anywhere in the world. Someone with the same experience level as yourself. It will be a blast! Just don’t forget to use ‘Undo’ lots (for mini matches). Try different attack combos. Order of attack is important so if you are new you should be hitting undo at least a dozen times per round. This is part of your training and the best way to get a sense of what’s possible with each unit. Without buying anything, new players can start up to 3 online matches. If one match is going too slow or has stalled, start another. Or start all three. This way you get to experience the round-to-round battle reports and see how the evolving ‘Round Summary’ looks after each turn. This will give you a great over-view perspective of Musket Smoke and will help things in the manual and tutorial make more sense. Just do it. Start some online Mini Matches. It’s the fastest an funnest way to learn Musket Smoke. Growing and protecting the Musket Smoke community. Now that we have a community, it only makes sense to try to protect and grow it. First we need more members. I’m doing my part with updates, and making MS2 which should redirect attention back to MS Classic. Plus some upcoming PR efforts. Your part is to play lots of random matches for ELO points, and to rate and review each update. If we both do our parts, the community will grow. The heart button will animate mildly after each new update as a subtile reminder that you could be helping Musket Smoke grow (if you want to). That’s not all though. I’m thinking we need some special scoring rules to help prevent cheating and also to help the new fledgling players from getting turned into gore piles. We need to protect our new players, or they will leave us and join some ‘other games’ community. The recent ‘new player zone’ is a small temporary bandaid for that effort. So here are some ideas that we can ponder over. 1) Elites can not score ELO points from Newbies. 2) The 3 in a row rule. You can only score ELO points on someone 3 times in a row, if you have a winning streak that goes to 4 wins then the 4th win doesn’t count as ELO points. This will reduce some forms of cheating and also prevent abusing re-match with a weaker opponent. This is not to be confused with a winning streak in general, it only pertains to the last 4 matches vs a specific person. 3) You get 2 yellow points for every rout (until) you become elite. Elite players only get 1 yellow per rout. This will help keep the Elite from slaughtering too much, and also help new good players catch up in the ELO rankings quicker. It will help give newer players more chances to win if they play well. This might not go over well with some people so this risky rule might not happen. The majority of elites would have to agree to this first. Another possibility is to just limit double yellow scoring to Newbies. 6) (Possible future idea, don’t expect this year) A public bulletin board. A global chat. Where you can chat and also post any round (from full replay) that anyone can see and chat about. 7) A map maker tool that allows you to make ‘mirror maps’ (same on both sides) and play them with random people. 8) Can put your custom maps up publicly for everyone to use. There is a chance that I may not do most of these things. At this point these are just some ideas to think about as the community grows. I would have to see significant community growth for the custom map and bulletin board tasks. If you really want to push these advanced features forward then try to spread the word about Musket Smoke. Help this game have the ability to properly pay the developer (me) for the extra work. Results of the in-game MS improvement survey. It was just one question. You can only select one answer from multiple choices and the results were interesting. The answers were: more maps, better maps, more units per map, bigger maps, iPhone/universal, more unit types, better solo play, more online players, more polish & fixed. New players were all about more unit types (and a bit of improved solo play). I guess a persons first impression is to expect more unit types than just the base 4 that you see in the solo training and Mini Match areas. Well if you buy the full multiplayer you get more unit types, so that’s probably why it was rarely chosen outside of the new player group. Intermediate players (30-200 pies, otherwise known internally as Vets) were mainly all about maps. Bigger, better, and more of them. So I’m glad I did that recent map refresh that improved a bunch of maps and converted a small map into a really big one. Elite players (200+) pies, were not particularly focused on anything. It was an even distribution across the whole range. Not one person selected iPhone (universal) though. That was a bit interesting to me. Wouldn’t you like to play a few rounds on the road once in a while? I have prototyped iPhone behaviour in testing and I found it awesome to get battle reports on your phone and sometimes play a round or two when you are out and about. These answers will help with Musket Smoke 2 (which is already on the right track with those answers), and may also help focus efforts when I get to minor updates for Musket Smoke Classic. In a future update I might repeat the same survey just to confirm the answer selections, or possibly try a new question. 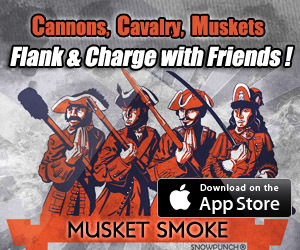 Musket Smoke update 1.53 was uploaded. There were a couple things with the update that caused a delay, but it’s all good now. This update refreshes 80% of the Mini Maps with adjustments and in one case a complete map replacement. The new player zones are experimental. I hope they work out. It’s always risky to split players into groups. Just don’t forget that ‘Random Opponent’ should be the most popular group. The ‘new user safe zone’, and the ‘elite zone’ might be a bit slow initially so maybe toss a random match in and if you don’t get a bite, try the normal ‘Random Opponent’ group instead. All 3 levels of players can enter the ‘Random Opponent’ area so it should be the most popular. If this works out the transition people have from new to intermediate and advanced should be a ‘bit’ smoother and more fun. At the very least new players can be comforted to know that their opponents will have the same experience level as themselves. My hope is that the elite players (200 or more pies) use the ‘Elite Zone’ at least half the time. This will allow the intermediates (30-200 pies) more opportunities to fight among themselves. Players above 30 pies (points) will not be able to enter the ‘new player zone’. They can’t even see it. It is a true safety zone. The 1.53 update – more than just bug fixes. I think it will be completed tomorrow. After looking at some analytics I figured out a few things that just needed to happen. For one, I want to change the daily process of the vets turning all the new players into gore piles before they have a chance to really get into the game. I’m not trying to take away everyones favourite pastime here. (Or maybe I am?) Regardless, to make up for taking away some of the easy low hanging fruit I decided to offer vets their own little club as well. So now Random Mini match-ups have 3 different possibilities. The normal ‘Random Opponent’ option. The ‘New Player Zone’ (only available to those with less than 30 pies). The ‘Random Elite Club’ (you need 200 pies, basically Captain or greater) to matchup here. But that’s not all. Two Mini Match maps will also be refurbished. The small one and the one with walls. There has been some complaints about these maps as being unbalanced and the wall one is also a bit too slow and defensive. I will make them bigger and more tactically interesting. Other than that the update will also finally address the ‘no moves’ bug once and for all. Plus a few other bug fixes as well and minor adjustments. It should be a good update.